160 ACRES IN MONTANA FOR ONLY $219,000!!! Escape to your own private retreat or maybe build a retirement home far away from the rat race. If you want some real elbow room, I have several 160 plus acres parcels available here at the Sarpy Creek Ranch. They all offer a place where you can really have yourself seclusion and privacy. MORE ACREAGE IS AVAILABLE IF YOU ARE INTERESTED IN UP TO 1000 ACRES! Parcel 24 is about a mile from the county road and about the same from power. It has lots of secluded draws with tall pines to give you all the privacy you could want. Lots of mule deer, turkeys and elk here, as well as grouse and some antelope. Owner financing is available with as little as 10 to 20% down for 10 years at 9.9% on approved credit. Call me today for details 406-580-3372. 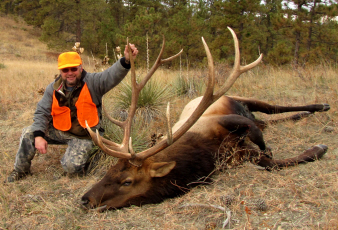 Great Hunting area for Mule Deer, Turkeys, Elk and Antelope! GREAT VIEWS AND PONDEROSA PINE TREES!!! PRICES RANGE FROM $209,000 TO $229,000! Springs on some and seasonal ponds on others. Real western ranch location with ridges and draws and sandstone rock formations. This property offers great views and is only 15 miles from the Community of Hysham, Montana (pop 300). The land is about 12 miles south of the Interstate and 80 miles to the east of Billings (pop 100,000). Power is about a half mile to the west.